These new Radiation Monitoring Kits come from the desk of the inventor of our traditional Geiger Counter Kit. RadMon kits are dedicated to radiation monitoring. Unlike a typical Geiger counter, they are designed to continuously report their readings to free monitoring and IOT sites via your WiFi network. They are generally used from a stationary outdoor location. These kits are based on the ESP8266 which provide the microprocessor and the WiFi connectivity. It's likely that these are the first kits to use this architecture for Geiger counters. The RadMon Plus connect directly to your GM tube and drive it with between 360 to 1000V. At a minimum they capture CPM, uSv/h and WiFi signal strength (RSSI) for transmission. They will also capture temperature, humidity, and barometric pressure if an optional BME280 sensor is used. After collecting the data, the RadMon Plus connect to your WiFi network and send the data to the monitoring and IOT sites that you specify. The software provides support to connect to any or all of - radmon.org, ThingSpeak and MQTT Brokers. A count and sleep cycle keeps power usage to a minimum. During the count cycle HV is supplied to the tube and events are counted. At the end of the cycle the RadMon Plus connects to WiFi and sends its readings. Following the transmission, the RadMon will enter sleep mode. The power demand drops sharply. At the end of the sleep cycle the RadMon wakes up and repeats the cycles. With the addition of good solar cell, charger and battery, powering the RadMon only with solar power works quite well. With WiFi connectivity, this makes for a totally wireless platform. The Build and User guides (linked below) provide the power budget and a solar powered example for each kit type. Please Note: These are not a traditional Geiger counters. There is no speaker for *clicks* and fresh counts are displayed at five second intervals .Sleep mode can be turned off for continuous operation, but in general, the RadMon kits are designed as a stationary monitors that send their data to IOT sites. Please Note: This is a soldering kit and needs assembly. It will take your around 30-60min to solder and assemble the kit completely. Please Note: A Geiger Mueller tube is not included in the kit and needs to be ordered separately! When counting, the LED flashes and counts are displayed on the OLED. This provides a snapshot of the current readings every 5 seconds, and a final screen showing the data sent and which sites it was sent to. Two pushbuttons are used to put the kit in HV adjust mode, configuration mode. 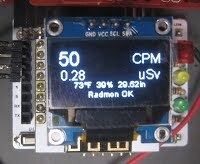 In HV adjust mode the high voltage is set with a pot and the voltage is shown on the display (and serial output). A carrier board is used to hold the ESP8266 for ease of replacement, and all common I/O pins are broken out.